This past Monday I worked roll-out at J.Crew Factory, which basically means I came in at 9 PM and stayed until 1 AM, unloading, unpacking, and getting all of the new clothes out on the floor. It was definitely tiring, but it was so fun to see all of the new arrivals. Subsequently, I was really excited for this collection of products and once I woke up the next day I was so excited to put a favorites post together. I'm loving the bright pink and green, it's so preppy and summery! Also, I've been living in the boardwalk shorts this summer; they are so comfy and can be transitioned from lounging around the house to going out. This newest round of products compiled a lot of my favorite things: fun colors, bold patterns, and classic silhouettes. 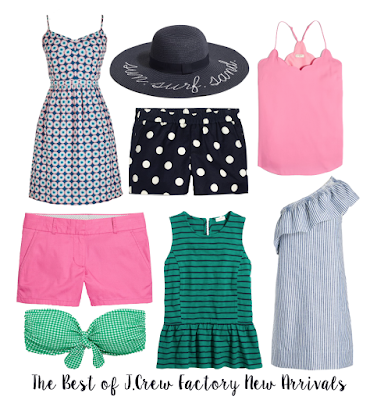 And as a result, I think I will forever be obsessed with J.Crew Factory.